Flying in formation, TanDEM-X and TerraSAR-X will generate a precise global elevation model. The main objective of the TanDEM-X mission is to generate an accurate three-dimensional image of Earth that is homogeneous in quality and unprecedented in accuracy. At present, the elevation models that are available for large parts of Earth are of low resolution, inconsistent or incomplete. In addition, they are commonly based on different data sources and survey methods. TanDEM-X, TerraSAR-X add-on for Digital Elevation Measurement, is designed to close these gaps and deliver a homogenous elevation model that should prove indispensable for many scientific and commercial applications. Orbiting Earth at an altitude of around 500 kilometres, the two nearly-identical radar satellites have begun mapping its surface. The first of the two, TerraSAR-X, has been operating since 2007. Three years years on, it has been joined by its twin satellite, TanDEM-X. Flying in close formation only a few hundred metres apart, the two satellites are imaging the terrain below them simultaneously, from different angles. These images are processed into accurate elevation maps with a 12-metre resolution and a vertical accuracy better than 2 metres. The amount of data generated by the satellites will grow to 1.5 petabytes within three years, corresponding to a storage capacity of almost 200,000 DVDs. Like the TerraSAR-X mission, TanDEM-X is a project developed under a public-private partnership between the German Aerospace Center, DLR, and Astrium GmbH based in Friedrichshafen, Germany. 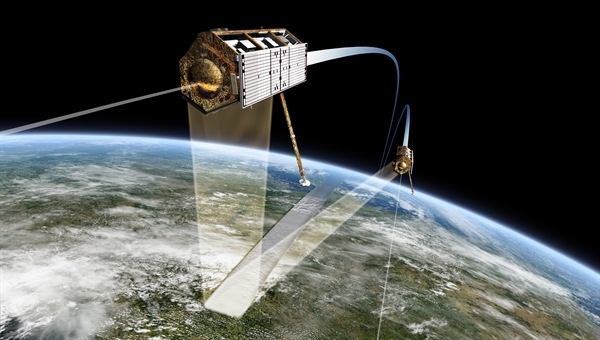 The TanDEM-X mission will survey all 150 million square kilometres of Earth's land surface several times over during its three-year mission. Apart from its high measuring-point density (a 12-metre grid) and high vertical accuracy (better than two metres), the elevation model generated by TanDEM-X will have another unrivalled advantage – being entirely homogenous, it will serve as a basis for maps that are globally consistent. Conventional maps are often fragmented along national borders, or difficult to reconcile as they are based on different survey methods or because of time lags between survey campaigns. Following in the footsteps of European radar satellites ERS-1, ERS-2, Envisat and TerraSAR-X, as well as the joint US-German-Italian Spaceborne Imaging Radar-C/X-Band Synthetic Aperture Radar (SIR-C/X-SAR) that flew on the Space Shuttle and the US Shuttle Radar Topography Mission, TanDEM-X seeks to support scientific and commercial applications of radar-based Earth observation. Demonstrating Germany's expertise in satellite-based radar technology, the mission is the result of a long-term focus in Germany's national space programme. The German Federal Ministry for Economics and Technology has funded the project (code 50 EP 0603). The TanDEM-X mission is financed and implemented as a public-private partnership between DLR German Aerospace Center and Airbus Defence and Space. Funded by the German Federal Ministry for Economic Affairs and Energy under the ID code 50 EP 0603, TanDEM-X is a Public Private Partnership (PPP) project conducted jointly by DLR andAirbus Defence and Space. DLR is responsible for providing TanDEM-X data to the scientific community, mission planning and implementation, radar operation and calibration, control of the two satellites, and generation of the digital elevation model. To this end, DLR has developed the necessary ground-based facilities. The project's scientific coordination has been entrusted to the DLR Microwaves and Radar Institute in Oberpfaffenhofen. Airbus Defence and Space built the satellite and shares the cost of its development and use. The programme line "Geo-Intelligence", part of the "Communication, Intelligence & security" business line of Airbus Defence and Space is responsible for commercial marketing of the data from both missions, TerraSAR-X and TanDEM-X.